This is the newest addition to our family. Her name is Sadie. 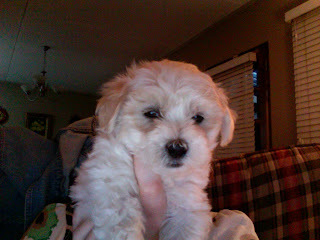 She is a 7 1/2 week old Malti-Poo. Isn't she cute? We Need a Booster Shot! Help! We need your help going to the throne of grace -- not so much for us, but for those whom we are trying to bring to the Lord's gospel. The longer we are here, the more overwhelming we find the work of influence. No doubt, you have heard how "explosive" the church has been here in Africa; how growth has been unparalleled; perhaps, even how the center of Christianity has shifted. Those types of sentiments sell books and challenge our perspectives, but the reality of ground experience is quite different. The situation is desperate. Numbers are impressive, but few core gospel truths resound: Fear over Grace, External Behavior over Internal Reality, Performance over Substance, Privilege over Service. I know -- this sounds familiar everywhere. And you'd be right. The difference is that the church here is so young and immature that it has little, if any discernment. And when a young church has little discernment, it will embrace anything that comes its way. 1) It is widely held in almost every denomination that Christians lose their salvation all the time. Assurance is never even a possibility. "What do goats beget? Answer: goats. What do birds beget? Answer: Birds. Now read John 1:12. "To as many as believed gave he right to become sons of God. Now, what does this verse say? It says, God begets what?" My stomach sank. Another occasion one preached: "God created Adam and Eve in heaven, not earth. Then he drove them to earth in a car." I think two examples are enough. 3) Fundraisers are held about once a month during the church service where a "master of ceremonies" pours guilt on the impoverished to contribute to some building project to look better than the nearest competition. Those words are used exactly. The Lord's service is turned (without protest) into a den of robbers. 4) Many of our students refuse to become pastors because they are afraid people will think they are NOT believers. The prevalence of unbelieving shepherds is so profound that our heart simply breaks, breaks, breaks. The good side is that we are having fruit, and we are seeing students "get it." But it is a slow, painful, and often frustrating process. And, moreover, once they "get it" the societal structure pressures them to just stay quiet. And so, we become like parents watching a child's addiction to heroin grow. You simply watch them kill themselves as they think life is okay. Please pray for the Lord to pour out substance on the church here. Pray for doctrinal purity, for discernment, and for a continued to willingness to learn. And pray for us to remember that the Lord is never surprised nor taken off guard. He will preserve His church and He will build His kingdom.